White Electric cigarette clasp case. 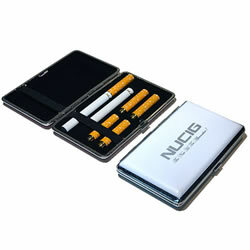 Buy UK NUCIG. This stylish and compact, clasped and locked case is ideal for safely carrying your electronic cigarette. Easily holds 1 full NUCIG (battery + filter attached) + spare battery + 4 separate filters. Compatible with the NUCIG, Advanced-Pro2, 3 & 4. The case has 2 "but" (well, Chinese workmanship): 1) the grooves for a cigarette and battery are bit too small - due to it the case doesn't close properly; 2) after 2-3 days a lock stopped to keep closed a fully loaded case (see:1), so I have to use a rubber band and spoiled the effect. Pity, a small things that can be fixed. Excellent. Great for when you are out and about.